Ice cream is one of the most loved desserts by all. Be it day or night, we can have a bowl full of ice cream anytime. If you are an ice cream lover then you know that the best part about ice cream is that it is available in an array of flavours. From strawberry to vanilla to chocolate, all the flavours of ice cream are dearly loved. 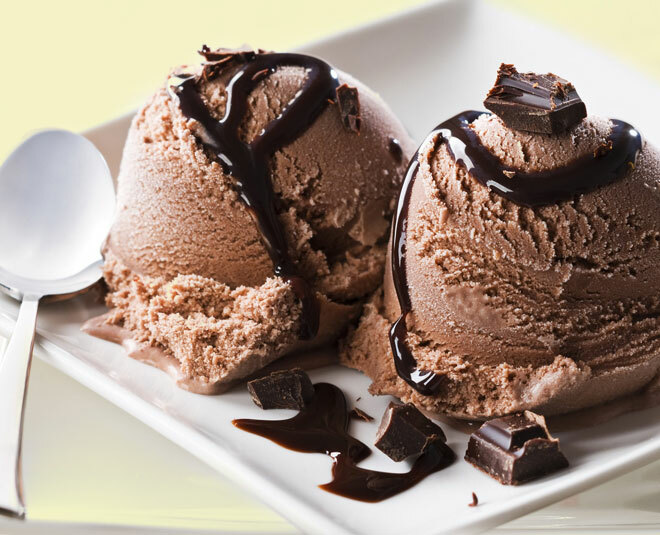 However, for all the chocolate lovers, chocolate ice cream is a delight. Do you know you can prepare delicious chocolate ice cream at home in just a few minutes without many efforts? Well, yes, with just a few ingredients, you can prepare creamy, chocolate ice cream at home. This recipe doesn't use any eggs also. This makes it a great option for vegetarians too. Some cocoa, condensed milk, and whipped cream, freeze and your irresistible ice cream is ready! Read on for the recipe. In a bowl, add sweetened condensed milk and cocoa powder. Mix the two well. Also, add vanilla extract and mix. Keep aside. Take another bowl and add whipping cream. Using a mixer, beat until stiff peaks form. Make sure that you don't overbeat. Next, add the condensed milk mixture to the cream bowl and mix with cut and fold method. You can garnish the chocolate ice cream as per your choice. You can pick from chocolate chips, choco flakes, chocolate syrup or even fruits. This one is a really easy recipe that is quick to prepare and turns out to be really delicious.